Every employee at UCSC should at all times be an active participant in preventing injuries to themselves and others. Employees and supervisors need to be aware of the potential for injury and capable of altering their surroundings or processes to prevent injury and avoid unnecessary risk. These actions and behaviors are common elements of a sustained safety culture and are essential components of an effective ergonomics program. Supervisors and employees need to know the simple basics of good workstation ergonomics and then put these principles into practice on a daily basis. Good ergonomic practices related to computer workstations are easy to understand, implement and monitor. If you use a computer workstation for more than 4 hours a day or 20 hours a week, EH&S recommends you work with your supervisor to take the following steps to ensure you are in compliance with the California Department of Occupational Safety & Health ergonomics rule, adhering to the provisions of UC labor contracts and are meeting the requirements of your departmental Injury and Illness Prevention Program. Most importantly you should follow these guidelines to ensure you meet the goal of remaining injury-free at your workstation. Sign up and take our UCSC online ergonomic assessment and training module. 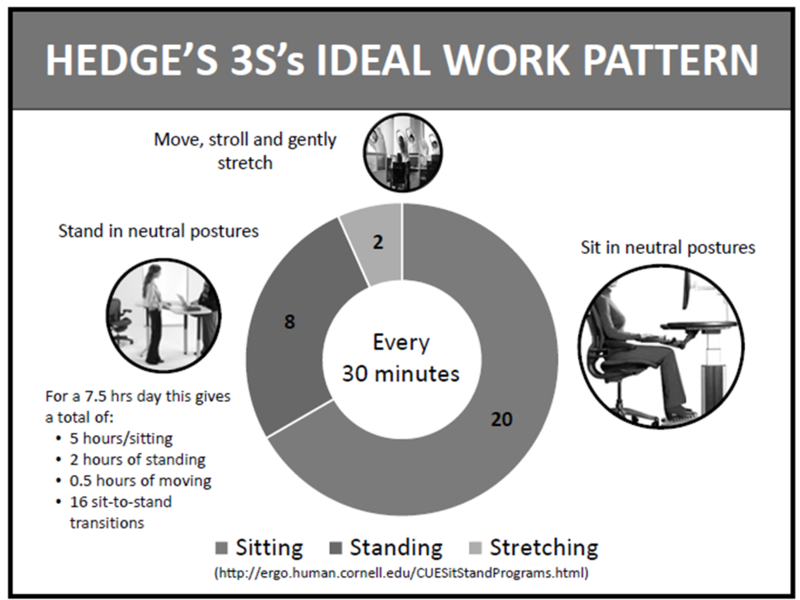 Make the changes suggested during this training class to your workstation to achieve the best posture. Review the email from the online ergonomic training system with your supervisor and/or Departmental Ergonomic Assessor (DEA) to identify any remaining needs. Visit the ErgoCruz page to find a list of the active DEAs by department. If you believe you need new or different equipment to solve a problem, discuss your situation with your supervisor, office manager, or DEA and work together to find a workable solution. If you are unsure whether you need new equipment or need information about what types of ergonomic equipment, including adjustable ergonomic chairs and desks, are available to solve your problems, contact the Campus Ergonomist, Brian MacDonald at 459-5430 at EH&S to find out more about available options. On a daily basis, ensure your equipment is properly adjusted and your posture remains appropriate. As much as possible make a habit of frequently changing your work activities at least every 20-30 minutes (i.e. stand up, walk to copier, look away from your screen, do some stretching), to avoid working in any posture for a prolonged period of time without moving. If you are unable to complete the UCSC online training and assessment or do not understand how to apply the information to yourself and your workstation, contact the Campus Ergonomist at 459-5430 to discuss this further or to schedule a site-visit. If you have not yet filed an injury report you should inform your supervisor. DO THIS RIGHT AWAY because it is important to initiate some supportive changes as soon as possible to prevent an injury from occurring. If you have already filed an injury report and are being treated for an ergonomic injury, speak to your occupational physician and request an ergonomic evaluation through the medical provider. Whenever you bring a new employee into your group, you need to provide them with information on logging into the UCSC online ergonomic training and self assessment and go over the results with them to determine what ergonomic needs should be met. If you have questions on how to correct a problem identified by the self-assessment by the employee, contact the Campus Ergonomist, Brian MacDonald at 9-5430 at EH&S. D) A manager or supervisor intending to refurbish an office or upgrade existing furniture or plan furniture/equipment for a new location: Contact the campus ergonomist with questions about optimizing the ergonomic support for employees whenever choosing new furniture as an office upgrade, renovation, move into a new location including all new building construction related furniture planning. For furniture design and office layout assistance also contact Janine Faylor of PBI at 757-4107, Ext: 201 or jfaylor@pbifurniture.com. This is a service provided by PBI and there is a fee. PBI is the local provider for furniture under the systemwide Steelcase contract. Do you work in a non-office environment? The Campus Ergonomist, Brian MacDonald at 459-5430 consults with all departments and work groups at UCSC to identify resources, provide training and recommendations regarding any equipment, work practices or other modifications to the work area or processes to improve employee ergonomic safety. Need help paying for ergonomic equipment? Check out our ErgoCruz page via the left navigation bar here on this page for our Departmental Ergonomic Assessor and Matching Funds Program information. Departmental Ergonomic Assessors can find forms and additional information related to their roles on the ErgoCruz page. To sign up for the training and self assessment, go to UCSC online ergonomic training. Log in using your CruzID and Gold password. For chair adjustment instructions and videos as well as other product assembly information visit the ErgoCruz program page. If you have additional questions or need to schedule a workstation ergonomic evaluation, please contact the Campus Ergonomist, Brian MacDonald at 459-5430.